Number 1: While everything is available at the farmers market, on a farm it’s a bit of a different story. Last week we had too many onions, no tomatoes and sweet corn coming out our ears, this week the corn is done, the onions are all eaten, sold or, sadly, rotten, yet we have buckets full of tomatoes and cucumbers nearing five pounds! Number 2: The harvest is plentiful now, but up here in Pennsylvania we are already starting to feel the first hints of fall: cold nights, damp days, and yellowing corn. Pretty soon summer will be over (next weekend is labor day), and farm-fresh food will be much more scarce. 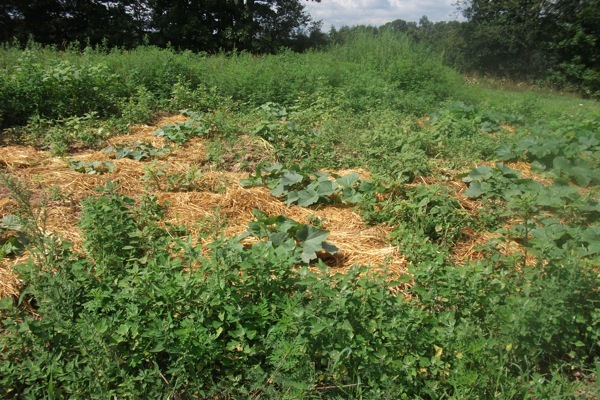 The over-abundance coupled with the soon-approaching fall makes food preservation a high-priority farm task. 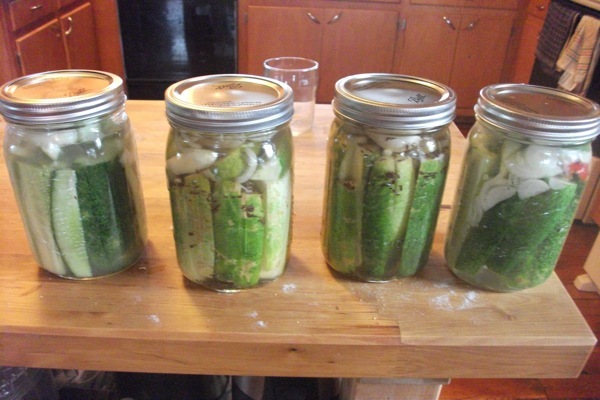 To deal with the giant cucumbers, we did what any farmer does: make cucumber pickles. Below I share the basic recipe, but feel free to get creative by changing the vinegar, like rice-wine vinegar for a more Asian pickle. Or change the seasonings: omit the garlic and add ginger, swap the dill for mint, use peppers, add fennel. The options are endless, and sense I recommend making small batches and storing them in the fridge, you don’t need to worry too much about canning safety. Cucumbers sliced into spears should be ready in about a week, but if you can’t wait that long, cut your cukes into slices and they will be ready to go in 48 hours. Prep your jars by running them through the dishwasher. Fill them with the cucumbers (if using spears, I like to lay the jar on it’s side so I can line them up nicely). In a large saucepot, combine the vinegar, water and salt. Bring that to a boil on low heat. Meanwhile, add 2 cloves of garlic, 1 tsp dill seed, 1/2 tsp pepper, and 1/2 tsp red chili flakes to each jar. Make sure to push the garlic down amongst the cucumbers. Once the brine has reached a boil, turn off the heat. Pour the brine into the jars (I recommend placing the jar in the sink and pouring the liquid into it – watch out, it is very hot!). Make sure to cover the cucumbers. You may have extra brine. Apply the lids and tightly close the jars. Shake the jar to evenly distribute the spices, then store in the fridge for up to one year. Make sure to label the jars. 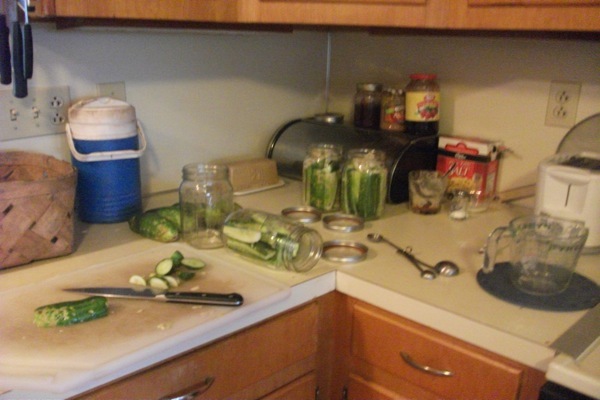 The cucumbers will be ready after one week (if spears) or 48-hours (if slices), and will keep getting better with age. You can process these in a water bath for 10 minutes if you would like them to be shelf-stable. We’re a gaggle of volunteers and opening a new scheme in our community. Your website provided us with useful information to work on. You have done a formidable process and our whole group will probably be grateful to you.